Super SCUBA Diving in the Philippines! What a great trip to the Philippines! Originally, I told my friend I didn’t want to go, but she asked me once more after her travel partner was badly injured in a car accident. I succumbed, but wasn’t terribly excited about it mostly because we were going all the way to the Philippines and not going to the most beautiful island in the world, Palawan, and also because I have been on a travel spree and was ready to be home to enjoy the summer in Denver. My trip to the airport didn’t help my attitude. I missed the 8:12am train to the airport by seconds. I literally pushed the button for the door to open, and the train departed the station. So I patiently waited for the next train coming in 15 minutes except after 30 minutes it hadn’t arrived. Finally, an announcement over the loud speaker stated it would not be coming and shuttle buses would service the airport. All of us at the station walked to the parking area when the train coasted up on the wrong side of the track to dump other stranded passengers at station. The announcement never explained when or where to find the shuttle buses, so most people stood in a bunch on the curb while calling a Lyft or Uber. After another 15 minutes, no shuttles had appeared, so I had to drive to the airport as my 2.5 hour window to get to the airport and through security had now dwindled to 1.5 hours. I asked another couple waiting around if they wanted to join me. I thought that was the least I could do, as many weren’t afforded the luxury to at least have their car nearby. I learned that the train I missed lost power on the track, so I suppose I was lucky to miss it, though my pocket book might feel otherwise after I not only paid for the train ticket and parking at the station, but also covered parking at the airport as I wasn’t signing up for hail damage. Miraculously, I got to the gate 15 minutes before boarding. After a 1.5 hour layover in Seattle, I continued on Korean Air to Seoul. Korean Air was very nice. The leg room in economy class was the most I’ve seen in some time which is sort of ironic given the small stature of the Korean race. The tallest Koreans on board were the flight attendants donning 3 inch heels who could barely reach the overhead bins. I can’t remember the last time I was given a toothbrush, toothpaste, and slippers in economy class either. I’d definitely fly the airline again. I met my friend, Rootie, in Seoul for our final flight, which again, I arrived at the gate 15 minutes prior to boarding time. Given the airline only begins boarding 20 minutes before departure, I was cutting it a little too close for comfort by Rootie’s standards. Be sure not to stand on the toilet! We landed in Cebu at midnight and the airport was bustling! I couldn’t believe how busy it was in the middle of the night. Of course, I didn’t realize the province of Cebu has a population of 3 million and Cebu City, 1 million. We weaved through the crowd, found our driver, and checked into the Movenpick for one night. Not having adjusted to the time change, we awoke early and enjoyed the giant buffet breakfast. The breakfast was spread over three counters. Hot dishes including both American breakfast choices like eggs and bacon and Asian choices like noodle soups and fish lined one side of the restaurant while fruits, cheeses and breads lined the other. Juices, teas, coffee and cereals were offered on the back wall. It was a really nice set up. Here we met Pete and Jo, some friends of Rootie’s from Austrailia. Our travels continued as we waited in the open-air lobby for our ride to Magic Island Dive Resort located in Moaboal on the southwest side of the island. The 2.5 – 3 hour ride took over 4 hours. The traffic on Cebu was crazy. I figured we’d be in some traffic in the city and soon we’d be on a deserted road driving through the tropics. Not so, we rarely saw any undeveloped land. Instead we passed through one town after the next with small stores, a church, and dilapidated houses. We also passed several festivals which may have slowed the trip on what seemed like the only road on the island. Nicest gas station bathroom I’ve ever been in! After all of this, I thought the diving and resort better be good! The resort was quaint with a small pool, open-air restaurant and bar, dive shop, and ten cabins. Rootie and I had a small twin bed cabin with a nice view of the dive boats that looked like canoes with outrigging. The dive shop area was fantastic. Instead of having to cram our gear in a locker, posts personalized with our names held our BCs. There was hanging room for our wetsuits next to our post, so we didn’t have to sift through a rack to find them. And at the bottom of each post was a crate for our mask, fins, snorkel, regulator, and booties. It was the best set up for a dive shop that I have seen. We spent the late afternoon and evening getting situated, relaxing, and enjoying tasty food. After a long two days of travel, we turned in early and were ready to start diving in the morning. Rowena, our divemaster who had laser vision, briefed us on our first two dives before we boarded the boat at 8:30am. The dive shop had three boats and our group of four got to enjoy our own! That alone was worth the 4+ hour drive yesterday. This part of the Philippines features macro diving…a lot of small stuff and nothing big. Being in the Pacific area rather than the Caribbean, Rootie and I were seeing several fish we had never seen. While Rootie prefers big stuff, she liked having several “firsts”, and I was in a photographer’s paradise! Jo and Pete, though familiar with the species in the Philippines since they came from Australia, were excited to see some of these rare critters. Our first dive was at Dolphin House, one of the furthest sites from the resort, and it only took twenty minutes to get there. We pulled on our wetsuits, buckled into our BCs, slipped on our masks and with our regulator in our mouth, we back-rolled into the warm water. We descended into a moderate current and mediocre visibility as we inspected the reef. Since I don’t dive often, I always do my first one without my camera, so I have no pictures to show for it, but I made up it thereafter. On our second dive, Kasai Wall, we saw several cool little critters including sea stars, a spot lobster, hawkfish, pipefish, frogfish, a nudibranch and a pygmy seahorse. I loved the pygmy seahorse which was maybe the size of the tip of my pinky finger. I’m not lying when I say we used a magnifying glass to get a defined view! The frogfish are interesting as well. They almost look like a piece of live coral. Having never seen one, I didn’t know what Rowena, Pete, and Jo were looking at until they pointed it out to me. It was a great dive with better visibility, little current, and LOTS of exciting firsts! After our two tank morning boat dives, we returned to the resort for lunch. The menu offered a variety of options, though the cashew chicken salad quickly became a favorite for many along with their smoothies. I think we were still recovering from our travels, so we weren’t inclined to go for an afternoon dive, but Jo and I went for a snorkel on the house reef in front of the resort. It was quite nice and dive worthy. Our favorite sighting was what looked like a ruby ribbon curled into a spiral which almost looked like a flower. Jo guessed it was fish eggs, and she was right. Rowena confirmed it was eggs from a Spanish Dancer. I wish I would have gotten a picture, but my camera wasn’t happy…grrr! The next morning, we listened to our dive briefing after breakfast and boarded Magic Island 2. Rowena remained with us, and we got the boat to ourselves again! Our first dive, just a short ride away, was called Copton Point, home to a small plane wreck. Not fond of wrecks, I was happy it was in shallow water, around 60 feet, and I could go explore nearby on the sandy bottom. My goodness this dive was fantastic! We spotted a devil scorpionfish, frogfish, a robust ghost pipefish, a flounder, a turtle, a mantis shrimp, a ribbon eel and more. After our surface interval where we remained on the boat eating fruit with water, tea or coffee, we dove Arigay Point, a beautiful wall. We saw an ornate ghost pipefish that I didn’t appreciate enough until Pete informed me they were very rare. Fortunately, Rowena planned to show us more. I also saw my first leaf scorpionfish, but failed to snap a good photo as the current gently pushed me by it (only got part of it). Oh well, I thought, Rowena, will show us another one given they were much larger, maybe the size of three fingers, than all the other tiny critters she was pointing out. Little did I know, this pair were the only two she knew of in the area. Oh well, at least I saw them along with other awesome marine life. It was another wonderful dive. Unknowingly, we happened upon Moalboal during its annual festival called Kagasangan. Due to elections the previous year, the festival didn’t take place, so this year it was even bigger. As such, we called for a tri-cycle to drive us into town so we could experience the culture. We fit three people on the motorcycle and in the side car as Jo opted for another snorkel (she is hard to get out of the water). Our driver told us he could fit seven Philippinos on the bike! We bounced along the rough dirt road past goats and chickens until soon we reached the town. Our driver walked us over to a field in front of city hall that was surrounded by people four feet deep. Along the way we passed a statue of St. John of Nepomuk, the town’s patron saint that the locals worshipped by melting candles on open fire grills. At the field, our driver pointed to the sky and explained sky divers were coming, but he didn’t know when. We ended up seeing one land soon after we left the crowd at the field and joined the crowd on the street watching the parade. Dancers in elaborate, colorful costumes danced to their music while a judge in a pin stripe button down shirt marked their scores. We found out later that the group we liked the most won. We only stayed at the parade for forty minutes or so as it was sweltering. I don’t know how those dancers weren’t sweating. We were drenched! From the parade, we meandered through the market that was especially large this Monday due to the festival. Brooms, rice, fruit, backpacks, and clothes were just a few items available in the dark maze. We ended our visit to the town with one more stop by the field as a dance competition was beginning. Locals were up in the trees in order to get a good view! We met up with our driver who took us back to the resort for only 300 pesos roundtrip (or $6). We had the best time! The next day we started with a very shallow dive at Panagsama to see a school of millions of sardines. Admittedly, this was not my most favorite dive. Other divers ended up diving the same area as snorkelers paddled around above us. In addition, there was a bit of trash. Much of the time the sardines were in extremely shallow water above the reef, so we couldn’t really swim with them, but toward the end of the dive it was fun to swim near them and see them divide and dart different directions. When we weren’t looking at the sardines, we were enjoying a turtle, a frogfish and more, but the reef was covered in sardine poo which looked like sand, so it wasn’t the prettiest. Rootie, however, was happy because there were lots of fish. Our next dive at Basdiot was like being in an aquarium. Small tropical fish swam around the magnificent soft and hard corals. On top of the lovely colors, we saw an electric fire clam, an orangutan crab, frogfish, and clownfish. The clam looks like it produces an electric current…kind of cool! After lunch, we decided on an afternoon dive. We took the boat to Mandarin Point where we got to see another pygmy seahorse, a crown of thorns, a cranky cream colored frogfish that didn’t like me snapping photos, and another ornate ghost pipefish. Again, the coral was amazing and the dive was awesome! Since we had purchased a ten-dive package and planned on taking a side trip to see the whale sharks tomorrow, we dove once more. It was a sunset dive on the House Reef in front of the resort where we watched the mandarinfish rise from the coral, mate, and drop back down into the coral. They are shy fish and really hard to capture in a photo. They don’t stay out of the protection of the coral long and their dark colors deep in the white coral seem to challenge the exposure capabilities of the camera. This was my first time to watch mandarinfish mate, and it was an interesting dive. We swam to a coral head where Rowena placed us around it in a circle. We waited until dark when the mandarinfish were more active. While we were waiting for them to mate, two of them got into a fight! One latched onto the other’s side and when one looked rather weak, a third fish came in and attacked it from the other side. It was totally crazy and far more interesting than the mating. For the mating, each time two fish rose from the coral, Rowena would shine her light on them. She was the only one that was to use a torch until we moved along on our night dive. As we watched the mandarinfish, a sea snake swam by us. These snakes are deadly, and I wasn’t terribly keen on seeing one at night. While they don’t generally attack and their mouths are so small it would be hard for them to bite anything but a pinky, I felt weary. As exciting as they are to see, I even felt uneasy when we saw one on the snorkel the other day. Anyway, getting a bit cold, I would have been happy to return to the dock after our thirty minutes with the mandarinfish, but instead we floated around the reef looking for other nocturnal marine life. Not a fan of night dives, I found the second half of this one dull with everyone clumped together…UGH! Oh well, it was worth it to see the mandarin fish…SUPER COOL! Wednesday, we joined most the folks at the resort for a 1.5 hour drive to a location where whale sharks are fed by fisherman in Oslob on the southeast side of the island. We had mixed emotions about going to see the whale sharks since it obviously wasn’t 100% natural, but given seeing a whale shark is a rare opportunity we decided to go. Rootie and I went to the Maldives a few years ago to see the resident whale sharks, and we never saw them! Pete, Jo and Rootie had all seen a whale shark before, but I hadn’t so perhaps they were swayed by me, as they said I should go no matter what. I had been to other areas where fishermen feed fish perhaps just by cleaning their catch, so from that perspective it didn’t seem too unnatural. At the same time, there were reasons to not support the endeavor according to a website we researched that said despite the rules restricting touching the whale sharks, some people still do. In addition, it suggests the whale sharks may start relying on the fisherman and perhaps approach other fishing boats and get finned. On the flipside, we learned that scientists are there every day to monitor the process. They determine how much the largest fish in the sea should be fed, and they know that no whale sharks have returned to the area. They pass through for a few months. The process is very controlled. 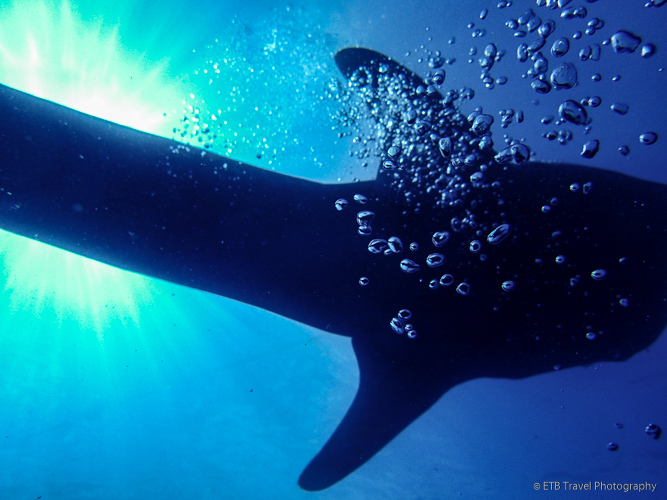 Divers must stay ten feet away from the whale sharks at all times and are allowed only one hour under water. The snorkelers join a line of boats and are only allowed 30 minutes. They must also stay with their boat and wait while the whale sharks come to them. We did one dive and one snorkel. To me, the dive was fair. We got close to them a few times, but the snorkel was off the charts cool. The whale sharks were so close!! It required quite a bit of self-restraint to just not reach out and touch them. I quietly hoped when they turned, they might lightly knock into me, but they have a keen sense of their surroundings. The largest one, which was probably 20 feet barely brushed my leg once. After our encounter, we enjoyed a BBQ prepared by the hotel staff “on the beach.” At least that is what the outing was billed to be. It was more like some tables set up next to the parking lot, but I have to say the staff at the hotel was magical. They always went above and beyond, and they knew us all by name. Overall, we decided it was worth the experience and would recommend it, though we would not go back a second time. We would also do the dive/snorkel format rather than two dives or two snorkels as the perspective between the two is entirely different. Upon return to the resort, we were supposed to do an afternoon dive, but something wore us out and we passed for a relaxing day. The only knock I have on the resort, is it would have been nice to be able to walk around, but the grounds were simply tiny and the dirt road wasn’t appealing, so at times I felt a little antsy and claustrophobic. SCUBA Diving in Sandy Bay, Roatan…A New Species?!? Previous Post How to Eat, Drink and Celebrate in New Orleans! Diving looks incredible. Your photos are fantastic! Love your pics Beth!!! Looks like a colorful trip! Wow, seriously, wow! Looks like amazing diving!! !